Webcampak 2.x is provided with a unified interface for both configuration and visualization. To access Webcampak for the first time, open your web browser and connect to: https://Webcampak-IP-address, replacing "Webcampak-IP-address" by the actual Webcampak IP. Web: will redirect you to the full Webcampak interface. 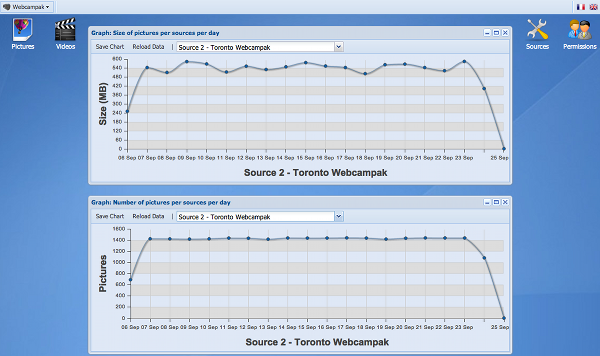 Using this interface you will be able to configure Webcampak and view its content. We strongly recommend you to use one of the three web browsers mentioned in this page. Webcampak is also compatible with Internet Explorer 9 and higher. Mobile: will redirect you to the mobile version of Webcampak. Created for iPad or similar devices this interface can be used to view, comment or send pictures by email. Our objective with Webcampak 2.0 was to create an easy and intuitive interface to view pictures & videos and edit Webcampak configuration, all of this from a unified interface. Two graphs are displayed by default ( graphiques présentant des statistiques (taille des clichés, nombre de clichés) par source. On the left of the screen, two buttons can be used to view pictures and videos. On the right of the screen, two buttons can be used to configure sources and permissions.